Throughout the world, people have special days when they gather family and friends to remember, celebrate and pray for family and friends who have died. 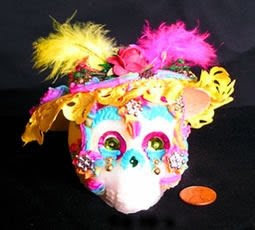 One of the richest of these traditions is Day of the Dead, or Dia de Los Muertos, dating back to Aztec times, and celebrated in Mexico and Latino communities in the US. On November 1st and 2nd, ancestors are permitted to visit the living. 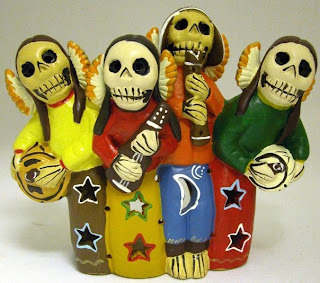 Families fashion altars out of sugar skulls and all manner of figures, festooned with foods and hobbies of the deceas ed. They visit their loved ones’ graves with these offerings in hand. 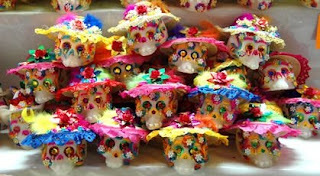 Crossroads Trade will celebrate Day of the Dead this year with sugar skull decorating for kids. Skulls will be available for purchase ($7.50 each). We’ll have paint, glitter and fun decorations on hand for children to festoon their skulls. Paints and decorations are free. CHILDREN’S DECORATED SKULLS WILL BE FEATURED IN CROSSROADS TRADE’S DISPLAY WINDOW from October 24th to November 1st. Crossroads Trade is a fair trade store, dedicated to preserving the world’s ethnic arts traditions. Crafts are purchased at fair wages from artisans, cooperatives, refugee communities, economic development initiatives and fair trade wholesalers.